It has been awhile since I have been my crafty wannabe self, but lately I have got the "crafty/re-organizey/wanna make my house cute- bug". I've been visiting my favorite antique store in the area, looking for inspiration, to vamp up our apartment. We recently looked at a house, quite randomly, and were seriously considering putting in an offer. But then we decided that it wasn't for us. So to get myself over my itch to buy a house, I've decided I need to be a bit more creative and re-decorate a little in here. First project- Chalkboard Frame. I am really happy with the way it turned out! Chalkboards are underrated- I can't believe they aren't even used in classrooms anymore. Oh how things have changed! 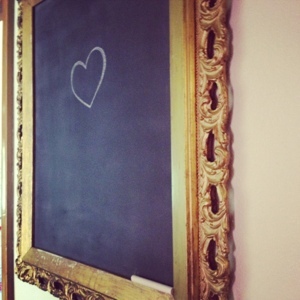 Chalkboards are a great way to bring personality to your home. Use it to write love notes to your spouse, keep score of the latest game tournaments, or to channel your inner child and just draw! 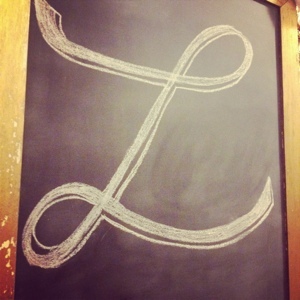 There are so many unique ways to use a chalkboard these days, just check out Pinterest and you'll find a ton! 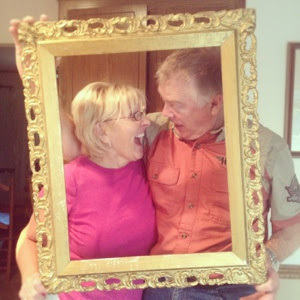 I also saw a really cute idea on sisterssuitcaseblog.com Check it out- and have fun!